When I was little and got sick, my mom sometimes fed me canned chicken noodle soup. I was never a big fan of that; those little flakes of chicken in the salty broth were never very appetizing. 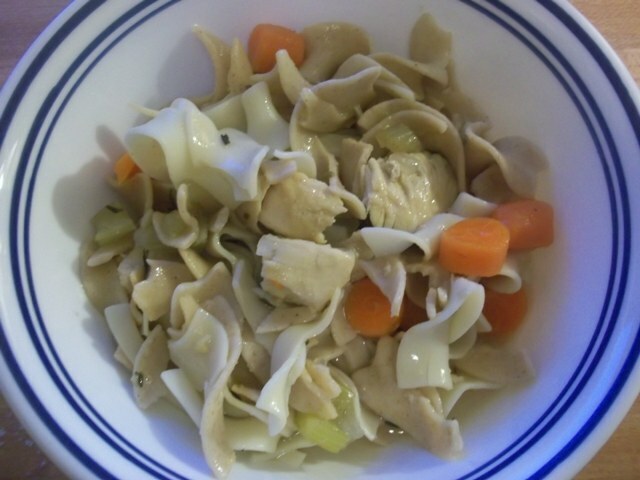 However, recently my husband has been making homemade chicken noodle soup that my kids love. I enjoy it, even with my aversion to chicken noodle soup in general. 1. In a large pot, place all of the ingredients except the egg noodles. Cook over medium for 15 to 20 minutes. 2. Meanwhile, cook the egg noodles until al dente in a separate pot. 3. Remove the chicken from the pot with tongs and dice it. Put it back in the pot, and cook another 10 minutes. 4. Add egg noodles and stir well to mix. Enjoy! Total = $4.54 (if ingredients are bought on sale), or $1.14 per serving. (This is better for a light dinner). okay I am on my way to the freezer to defrost a chicken now. This sounds so good. Thanks for the receipe.